Generic Zyban SR (Bupropion SR tablets) is a medicine prescribed by doctors as an aid to smoking cessation treatment to help patients stop smoking. In the case of many patients, Bupropion SR tablets reduces withdrawal symptoms and the urge to smoke. It is not the same as nicotine replacement treatments instead, this medicine is thought to act in the brain to decrease cravings for tobacco. You can buy Bupron SR tablets, the generic name for Zyban SR, manufactured by Sun Pharmaceutical Industries Ltd. in the strengths of 150 mg from our online pharmacy. We also have in stock Generic Wellbutrin XL (Bupron XL Tablets) which is used for the treatment of Major Depressive Disorder (MDD) as well as the treatment of Seasonal Affective Disorder (SAD). We supply original Bupron SR manufactured by Sun Pharmaceutical Industries Ltd.. The active ingredient present in Bupron SR is Bupropion Hydrochloride. 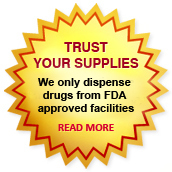 Each Bupron SR tablet contains 150 mg of Bupropion Hydrochloride. Bupron SR 150 mg tablets (Generic Zyban SR) is used to help stop smoking. Bupron SR works by blocking the reuptake of norepinephrine and dopamine so that more of each chemical remains in the space between the brain's nerve cells. This gives these substances a better chance of activating the receptors on the next nerve cell. This action can help people be more successful at quitting smoking. Generic Zyban (Bupron SR tablets) should be swallowed whole and not be cut, crushed or chewed as this may lead to an increased risk of adverse effects including seizures. Administration of Bupron SR tablets has to begin one week before quit day. The starting dose is 150 mg per day for first 3 days. The dose has to be increased gradually to reduce seizure risk. After 3 days, increase the dose to 300 mg per day, given as 150 mg twice daily at an interval of at least 8 hours. The recommended starting dose of when Generic Zyban SR tablets quitting smoking is 150 mg Bupropion SR, taken once daily in the morning. As soon as the fourth day of treatment, your healthcare provider may increase this to 150 mg Bupropion taken twice daily. You should start taking Bupropion while you are still smoking, because it takes about a week to build up the required level of the medication in your blood. You and your healthcare provider should choose a "quit date" -- usually sometime in the second week you are taking Bupropion. You should take Bupropion for at least 7 to 12 weeks. If you have not made any progress toward quitting by the seventh week, your healthcare provider may decide to take you off this medication. However, if you have successfully stopped smoking, your healthcare provider may decide to keep you on it for several months, as Bupropion can help you from starting smoking again. Generic Zyban SR (Bupron SR tablets) is contraindicated in patients with known hypersensitivity to Bupropion Hydrochloride or any inactive ingredient present in Bupron SR tablets. Bupron SR tablets (Generic Zyban SR) should not be given to patients who have a Seizure disorder, Current or prior diagnosis of bulimia or anorexia nervosa or in cases of abrupt discontinuation of alcohol, benzodiazepines, barbiturates, antiepileptic drugs. Bupropion HCl (Generic Zyban SR) is also contraindicated in a patient who is being treated with linezolid or intravenous methylene blu. Most common Bupropion SR Side effects with an incidence rate of 5% and at least 1% more than placebo rate are insomnia, rhinitis, dry mouth, dizziness, nervous disturbance, anxiety, nausea, constipation, and arthralgia. As with any medicine, side effects are possible with Bupropion SR. However, not everyone who takes the drug will experience side effects. In fact, most people tolerate it quite well. If side effects do occur, in most cases, they are minor and either require no treatment or can easily be treated by you or your healthcare provider. About one-third of all Bupropion overdoses cause seizures. It is important that you seek medical attention immediately if you believe that you may have overdosed on Bupropion. Tell your healthcare provider about all of the medicines you take, including prescription and non-prescription medicines, vitamins, and herbal supplements. People taking certain medications have a higher risk of seizures. Abruptly stopping alcohol or sedative medications can also increase your chance of seizures. To avoid seizures, you should not take more than 300 mg of Bupropion per day, and each individual dose should not be greater than 150 mg.
Bupropion can cause high blood pressure (hypertension), especially in people using nicotine patches at the same time as they are taking Bupropion. Your healthcare provider should monitor your blood pressure if you are taking Bupropion along with nicotine patches. Be careful when drinking alcohol while you are taking this medication. In case you drink a large quantity of alcohol or suddenly stop drinking after long periods of regular intake, you may increase your chance of having a seizure. Some people may find they are more sensitive to alcohol while taking Bupropion HCl tablets. Therefore, it is important to discuss your use of alcohol with your doctor before you begin taking Generic Zyban SR. Zyban is contraindicated in patients undergoing abrupt withdrawal from alcohol or sedatives. There have been rare reports of adverse neuropsychiatric events or reduced alcohol tolerance in patients drinking alcohol during Generic Zyban SR treatment. The consumption of alcohol during Bupropion HCl treatment should be minimised or avoided as fits are more likely if you regularly drink a lot of alcohol. Bupropion HCl has been classified by the US FDA as Pregnancy Category B. Epidemiological studies of pregnancy outcomes following maternal exposure to Bupropion in the first trimester have reported an association with increased risk of some congenital cardiovascular malformations. The prescribing doctor will need to consider the option of alternative treatments in women who are pregnant or are planning to become pregnant, and should only prescribe Bupropion if the expected benefits are greater than the potential risks to the fetus. This medication should be used during pregnancy only if clearly needed. This medicine may be harmful to an unborn baby. Inform your doctor if you are pregnant or plan to become pregnant during treatment. Bupropion HCl and its metabolites are secreted in human milk. Due to the potential for serious adverse reactions in nursing infants from Bupropion HCl tablets, a decision should be made whether to discontinue nursing or to discontinue Generic Zyban SR, taking into account the importance of the medicine to the mother. Do not use this medicine without telling your doctor if you are breast-feeding a baby. You can buy Generic Zyban SR online from Clear Sky Pharmacy at a cheap price. Bupron SR Tablets 150 mg pills, manufactured by Sun Pharmaceutical Industries Ltd., India are supplied in a blister strip of 10 tablets. The 150 mg tablets cost only $0.40 per unit when you place an order for 240 tablets.